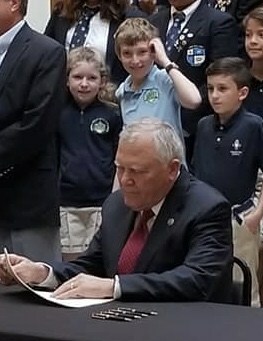 This week, Governor Nathan Deal signed House Bill 217 into law and 2 of our students, Will and Audrey Jane Leftwich, were there to witness the excitement and represent GRACEPOINT! This bill increases the annual cap on the Georgia Education Expense Credit Program from $58 million to $100 million for the next decade. The signing of HB 217 marks the largest expansion of this program since its inception in 2008. The increase in the cap on Education Expense Credits will provide thousands of additional Georgia students the opportunity to attend the schools of their parents' choice! Thanks to everyone who reached out in support of increasing the cap for Georgia GOAL. Many of our students at GRACEPOINT benefit from this wonderful program each year. We hope you will all consider redirecting your tax dollars in 2019 to support scholarships for dyslexic students at GRACEPOINT. GOAL will begin accepting tax credit applications on June 1, 2018.